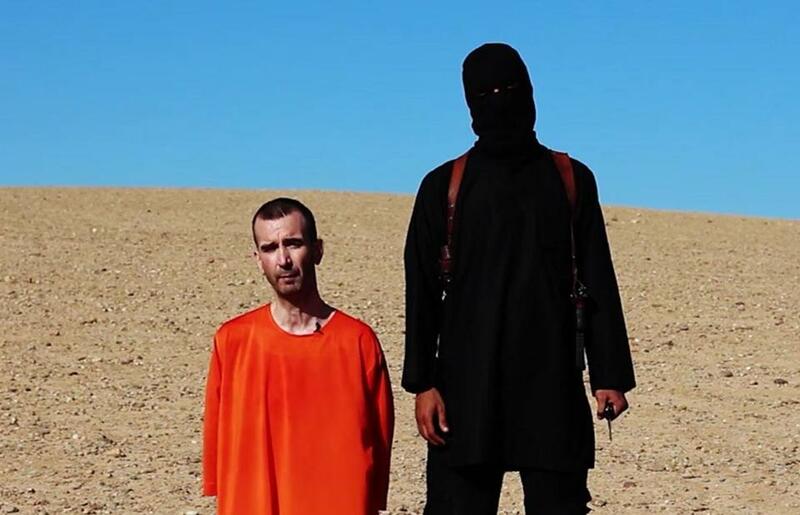 David C. Haines, 44, was allegedly beheaded; his family had pleaded last week to speak with his captors. Haines is the third Westerner beheaded in recent weeks by the Islamic State group, which has seized vast swaths of territory in Syria and Iraq. ‘‘We will do everything in our power to hunt down these murderers and ensure they face justice, however long it takes,’’ Cameron said. The video shows the aid worker, David Cawthorne Haines, kneeling on a bare hill under the open sky, in a landscape that appears identical to where two American journalists — James Foley of New Hampshire and Steven Sotloff of Florida — were killed by the group in back-to-back-executions in the past month. In the moments before his death, the 44-year-old Haines is forced to read a script, in which he blames his country’s leaders for his killing. The video ends with the black-clad executioner, again in a British accent, identifying their next victim as Alan Henning, another British citizen. The killing was a clear message to Britain, a key ally of the United States as it builds an international coalition to target the militant group. Cameron returned to his residence at 10 Downing Street shortly after midnight. He is expected to chair a meeting of the government’s emergency response committee early Sunday. Cameron’s government is a member of a core coalition of nations announced as NATO leaders met in Wales this month and sought to devise a strategy to address the growing threat from the Islamic State. That strategy includes plans to strengthen allies on the ground in Iraq and Syria and to conduct airstrikes against the militants. Britain and the United States are among the only nations in the world that have held to a hard-line, no-concessions policy when dealing with kidnappings by terrorist groups. Until this year, the Islamic State was holding close to two dozen foreigners in the same jail where Haines was imprisoned on the outskirts of the Syrian town of Raqqa. His European cellmates were released for ransom, one after another, according to one of the hostages held alongside him who was recently freed after his government paid a ransom. Haines, who had a military background, was kidnapped 19 months ago in northern Syria and was held alongside an Italian coworker, Frederico Motka. Both men worked for ACTED, a French aid group, and had traveled to Syria to try to help during the country’s horrific civil war. Their fates diverged based on their countries’ policies: Motka was released in May, one of 15 Europeans who were released from the same Islamic State-run jail for a ransom, according to a person familiar with the hostages’ detention and release. The SITE Intelligence Group, a US terrorism watchdog, reported the video, which was also posted online by users associated with the Islamic State group. Late Friday, the family of Haines had issued a public plea urging his captors to contact them. Foley’s parents, of Rochester, N.H., last week announced the formation of the James W. Foley Legacy Fund to honor him. The fund will develop a resource center for families of American hostages and seek to foster global dialogue on governmental policies in hostage crises. It also will support American journalists reporting from conflict zones and promote educational opportunities for urban youth. In Syria on Saturday, government warplanes and helicopter gunships struck targets in a central village in what appears to be preparations for a ground offensive on the rebel stronghold, activists said. The air raids on Kfar Zeita, which has been under rebel control for nearly two years, came amid a major government offensive in the religiously mixed central province of Hama. They came two days after troops captured the strategic town of Halfaya, better positioning government forces to defend nearby Christian and Alawite communities that support President Bashar Assad. Central Syria is a communal patchwork home to large groups of Christians, Ismailis, and Alawites, who mainly back Assad, himself an Alawite. Many from these groups fear attacks on them by extremists among the mostly Sunni rebels. Material from the Associated Press and New York Times was used in this report.